The wheels/axles of a commercial vehicle are arguably the most important part. Getting the most out of your vehicle requires correct maintenance. For optimal performance, your vehicle should regularly undergo wheel alignment diagnosis and adjustment when required. 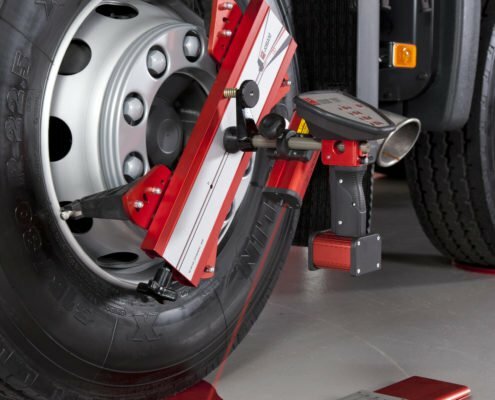 Wheel alignment is setting the angle of the wheels so they track in the right direction. 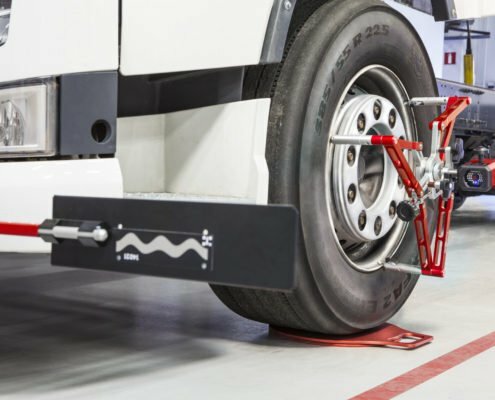 Most commercial vehicles come with individual wheel alignment settings meaning; each of the axles of the vehicle have to be separately aligned. 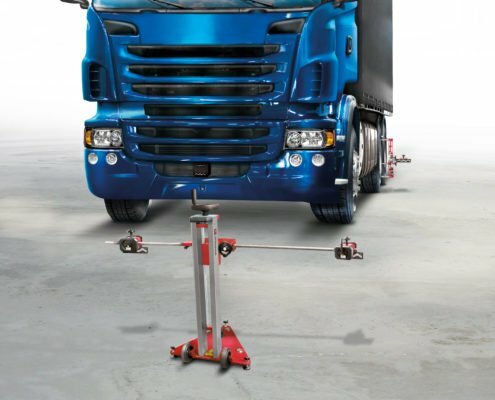 If you’re looking for HGV wheel alignment equipment or any commercial vehicle wheel alignment equipment Josam is the industry standard. Learn more about each of our solutions below. 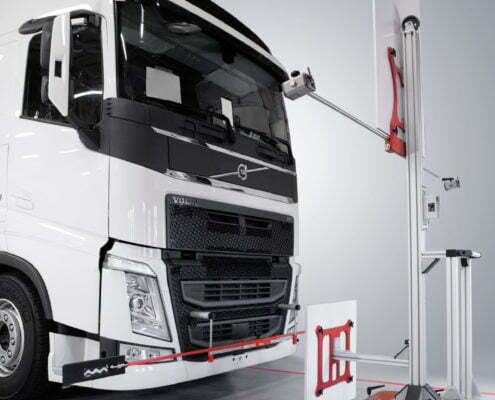 Proven fuel savings with correct wheel alignment – Volvo trucks carried out an isolated test on correctly aligned commercial vehicles against incorrectly aligned vehicles using Josam / TruckCam equipment. The tests showed correctly aligned vehicles can reduce fuel consumption by 2.5%. The tests also showed that should the truck have incorrect tyre setup (type of tyres and air pressure) the fuel savings could be up to 15%. 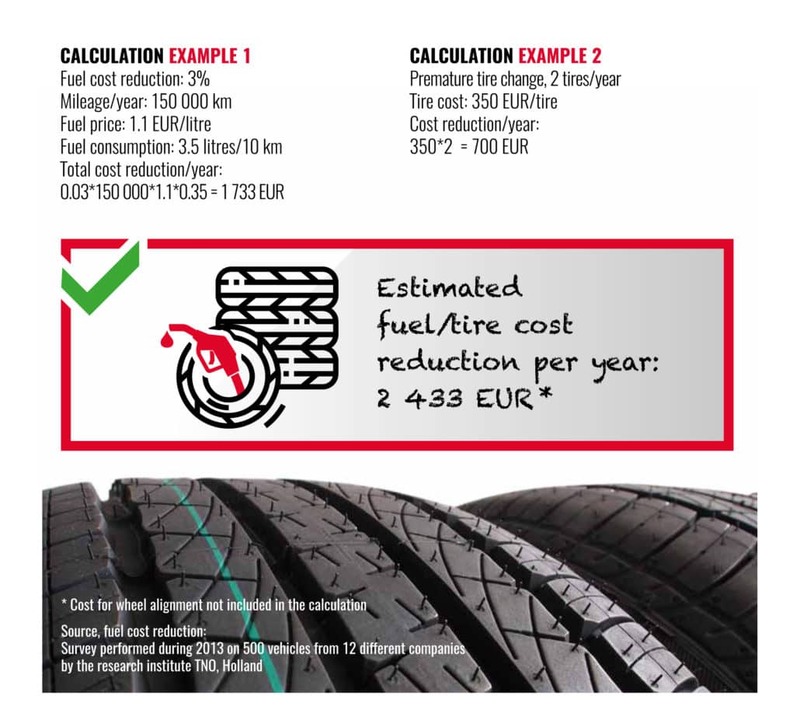 Download the global wheel alignment packages and induction heating brochure. Heavy goods vehicles (HGV) trucks, semi-trailers, tractor units, semi-trailer trucks. vans and pickups 4 x 4’s. Plant Vehicles, earth movers, graders, cranes. Farm vehicles, tractors, combines, seeders. Camber: is the tilt of the tyre when viewed from the front of the truck. Insides of tyres tend to wear prematurely on vehicles with too much negative camber on the other hand too much positive camber will wear the outside tread. Caster: simply is the inclination of the front spindle. When the caster is out, it creates a pull or wandering condition and sometimes a slow responding steering wheel. Toe: is measured in degrees & minutes . 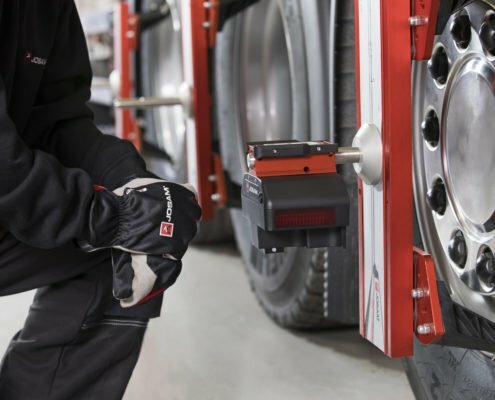 When viewing the truck from the front, it is the difference between the front and rear center-line of the tyre. Toe-in means the fronts of the tyres are closer together. While toe-out means, the fronts of the tyres are further apart. Toe-in or out have the most effect on tyre wear. Maximum turn: The measurement of distance between the center line and max steer (left and right) or full lock. Parallelism: Parallelism is when you have 2 axles and it takes the toe difference’s between both axles. 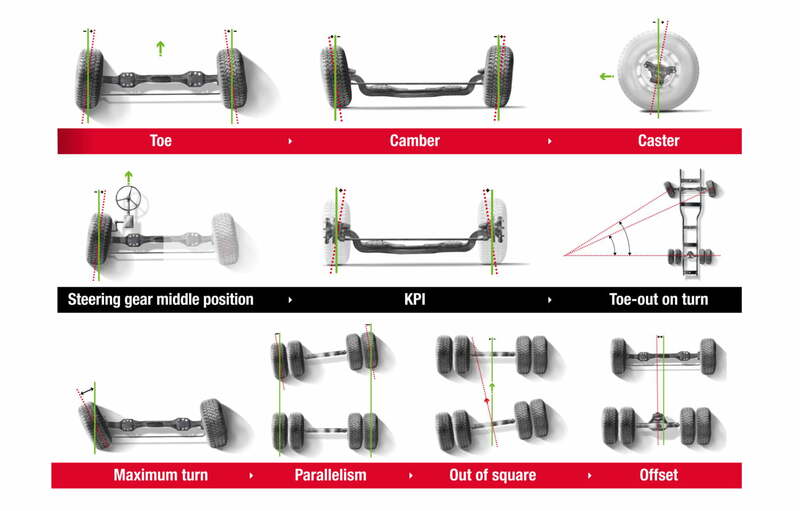 Axle offset: Axle offset is how axle centres are in relation to the centre line of the vehicle. Toe out on turn: The toe-out on turns is the angle of the inner wheel to the outer wheel when negotiating bends. The steering is constructed so that the angle of the wheels to one another changes with an increased steering angle.